have been his full time caregiver ever since. know how to get in. I was so alone and had lost my tribe. 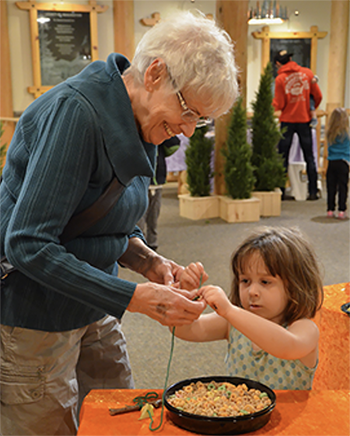 Two months ago I received a flier with information about Imagine Children’s Museum’s new “GRANDfamilies” program – free private Museum time for grandparents who are raising their grandchildren. I immediately marked my calendar and was excited to attend. I had never been to Imagine and was looking forward to a new activity with my grandson. Upon entering Imagine the morning of GRANDfamilies I was greeted by a smiling staff member who showed me around the Museum. My grandson immediately began playing with the exhibits and especially loved the water exhibit. The staff member checked in with me and encouraged me to talk to others. She explained that others there are in similar situations and would look forward to sharing their experiences. I soon began talking with another grandmother and was comforted by the fact that I was not alone. She helped me with the Facebook group and we exchanged phone numbers. When it was time to leave, I found the staff member and gave her a hug. I thanked her and let her know that we could not wait to return next month. I had found my tribe. Families are dealt difficult life challenges every day and we all need a hopeful place to gather, play, share and feel safe. GRANDfamilies fulfills a vital need and creates a sense of belonging for the many grandparents like me raising grandchildren in our community. Please consider a generous donation today to Imagine’s Year-End Campaign. Your gift will make a greater impact than you might ever know.